Season two of Star Wars Rebels consists of 22 episodes, which includes the movie event Siege of Lothal. That is what most people have experienced when discussing the second season. However, that is not the only way to experience the Ghost crew and their continued growth resisting the Empire! Just like season one of Rebels, there is another side to the season. If you have not done so, check out my guide to The Other Side of Rebels: Season One. Below is my guide to explore the extra materials between the episodes of the second season of Rebels. Before I begin I do want to mention that there was a novel released before season 2 of Rebels that you may want to read before this guide. Set about one year after the events of the Revenge of the Sith movie is the young adult novel Ahsokaby E. K. Johnston (review here). The novel Ahsoka bridges the the story line of Ahsoka Tano from her departure in The Clone Wars to her arrival in Rebels. Just like A New Dawnnovel by John Jackson Miller in the season 1 guide, the only reason why I am not including it in this list is due to it being placed in a different reading guide set around the beginning of the dark times of the Empire (I’ll link to that list in the future). For brevity, descriptions of the episodes are purposefully omitted. In addition, there is not as much extra material in the second season, but what we got was truly special. Most of this material focuses on the female characters of Star Wars, which was wonderful! Sadly, I still have to omit the Rebels Magazine comics due to it being practically unavailable. This also includes Michael Kogge’s short story “Rebel Bluff” mentioned in the bonus of the previous guide. I hope one day it can be found outside of Star Wars Insider issue 158. The majority of these entries consist of short 2D animations by Lucasfilm Animation and Ghostbot. Written by Jennifer Muro, these short animations are designed to focus on smaller moments that define a character. The official Disney YouTube channel released each segment individually and bundled together into two volumes that has a connecting story of Maz Kanata between segments. I will be linking the individual segments in this guide. The Leia, Princess of Alderaan novel by Claudia Gray (review here) is centered around Leia Organa after her 16th birthday, and shows how she got involved in resisting the Empire. 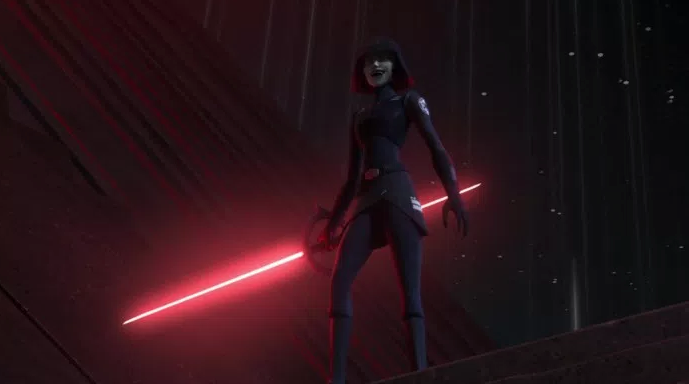 By the end of the novel there is a gap of a few months before her appearance in season 2 of Rebels. I placed it after “Siege of Lothal” movie event due to where the story ends. What I enjoy most about this novel outside of what I wrote in my review is how it clarifies the state of the Rebellion. We see how the Ghost crew views Phoenix Squadron in “Siege of Lothal,” and we are shown there is no Rebel Alliance yet in Leia, Princess of Alderaan. “TK-462” short story by Sylvain Neuvel originally released as “TK-146275” in Star Wars Insider Magazine issue 166. The short story followed brief moments from a stormtrooper’s life. The interesting thing about this story is elements that this story tackles appears in the Thrawn novel by Timothy Zahn (review here), where being from the Outer Rim is discriminated. The short story does get really dark, which is a contrast to the rest of the material in the list. 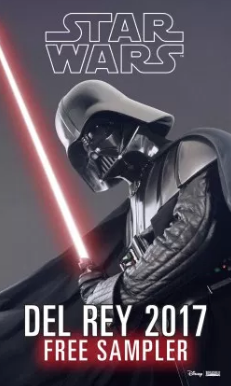 In addition, it is important to note that the final setting of this short story was changed from the planet Lothal to Belderone in the Star Wars 2017 Del Rey Sampler (free digital version is available). The Forces of Destiny short can be found here. We can see Leia has grown from her story in Leia, Princess of Alderaan. The information from Rex was not the only source of information to new potential bases. The Ghost crew and Phoenix Squad are still scouting for a new base, and Leia has stepped in to help. The surprise appearance from a certain bounty hunter was fun! It is great that Sabine and Leia had a moment to interact in this short. The mysterious stranger returns! If it is not obvious from her appearance in both shorts we learn of her real name– Jyn Erso. What is special about the moment she reveals herself is how she could relate, with the little girl she helped out. She could trust the girl in that moment to not repeat her name to the Empire. If you read the Rebel Rising novel by Beth Revis (review here), you can read more about how Jyn grew up, with Saw Gerrera as a mentor, and how she learned to survive on her own until Rogue One. There is a time period before she is imprisoned on Wobani that left open her story to other planets in the galaxy. These Forces of Destiny shorts are apart of that time. 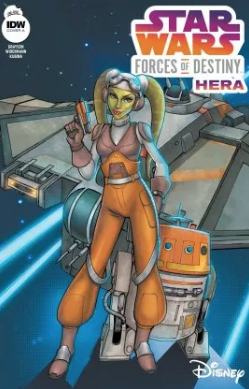 IDW Publishing released a comic of Hera Syndulla and Chopper on a mission of their own. The story was written by Devin Grayson, and illustrated by Eva Widermann. From the very beginning of the Rebels TV Show Hera has been inspiring the Ghost crew, with her leadership skills. This story shows her continue on that path of leadership on her scouting food supply mission to Fekunda Outpost. This story did remind me of the Ahsoka novel as how a agricultural planet is targeted by the Empire. Making life altering decisions can be hard to commit to. 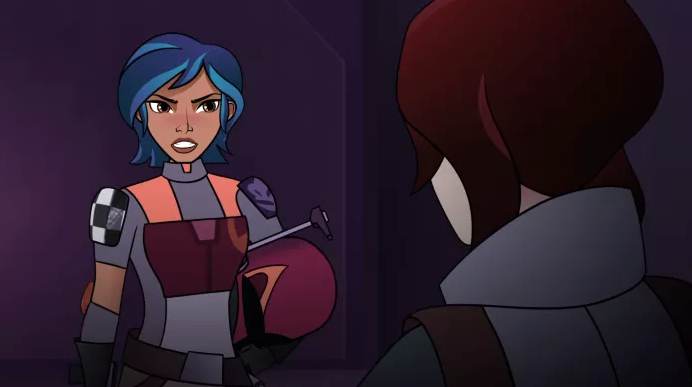 As is the case of Sabine Wren’s friend Ketsu Onyo. From living the life under the Black Sun’s thumb it is great to see that she still has compassion. This short does show that even though the Ghost crew and Phoenix Squad have found their base, they still need to help move food supplies to the rebel cells and those in need. Kanan is not the only one to have a sweet speeder bike. Just as her friendship with Kestu is still fresh as the paint on her speeder bike, there comes a time of trust and understanding. It takes a lot to rebuild a friendship. Especially how strong the bond was in the past. The reason I placed “Newest Recruit” and “Crash Course” towards the end the season was due to Ketsu’s appearance in “The Forgotten Droid” episode, where she was apprehensive to joining the resistance, and still had the Black Sun emblem on her left shoulder. Watch “Twilight of the Apprentice” two part finale! There is not anything to read or watch before the two part season finale, so grab some popcorn and tissues as it is one shatterpoint in the Star Wars timeline that will leave so much discussion to come! In the End, these between the episodes stories were a delight to go through. I just wish that the Forces of Destiny shorts were a lot longer! We learned more about the state of the rebel cells from Leia, Princess of Alderaan. We got to see characters outside of Rebels TV show make an appearance, which connected to the Rogue One movie. We got more female character focused stories, which has been needed for so long. If more stories release set around Season 2 I will update the list to reflect. Though, I imagine the next wave of new stories, with the Ghost crew will be around the third season and onward.